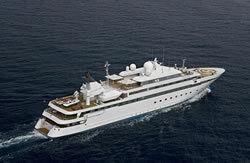 Motor Yacht Lauren L The luxury motor yacht "Lauren L" is 90 meters (296ft), with accommodations for 40 guests in 20 spacious staterooms and is offered for charters in Mediterranean, Greece and Greek Islands. This motor yacht was built in Germany in 2002, refitted in 2004 and 2008 with SOLAS classification to the highest standards of both safety and comfort and is ideal for an enjoyable cruising vacation for either a very large family, or as a corporate meeting conference venue. This yacht has enormous open entertaining areas as well as small, intimate areas for private discussions, abundant sunbathing space and covered terraces, a superbly equipped business center plus a vast array of leisure equipment. Day and night, the yacht provides everything to ensure the complete success of your charter that include a Beauty salon, a Conference center seating 17 around a Mahogany table with a 50 inch plasma flat screen multi media TV system with multi function panel for internet video conferences and a library with computer internet access and a comprehensive selection of books. All suites have permanent computer internet access. Separate dining areas, one seating 12 persons and the other 50 persons. Other facilities include open bar areas, sun deck with Jacuzzi, four large tenders, helicopter landing pad, a Health and Beauty center, and an open air restaurant. All suites have permanent computer internet access. 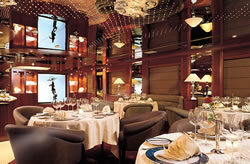 Separate dining areas, one seating 12 persons and the other 50 persons. Other facilities include open bar areas, sun deck with Jacuzzi, four large tenders, helicopter landing pad, a Health and Beauty center, and an open air restaurant. BEAUTY AND HEALTH: Health and Beauty Center, including Sauna, Steam room, Gymnasium, Aromatherapy, Relaxation Room with aquarium, Beauty Salon, Hair & Nail Saloon, Massage Room. Throughout the day, relax on the sundeck. After a session in the gym or sauna, have a massage before sunbathing and cooling off in the Jacuzzi. Have lunch, buffet style, before trying out the jet skis or other equipment. The beauty salon can help get you ready for the evening. 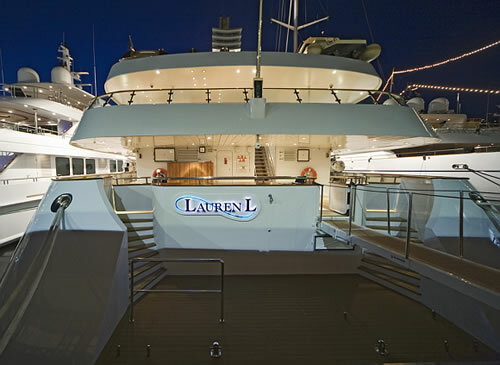 Would you like to charter Lauren L? All suites have permanent computer internet access. 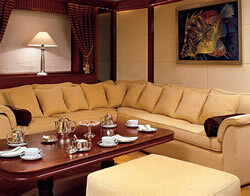 Separate dining areas, one seating 12 persons and the other 50 persons. Other facilities include open bar areas, sun deck with Jacuzzi, four large tenders, helicopter landing pad, a Health and Beauty center, and an open air restaurant. BEAUTY AND HEALTH Health and Beauty Center, including Sauna, Steam room, Gymnasium, Aromatherapy, Relaxation Room with aquarium, Beauty Salon, Hair & Nail Saloon, Massage Room. 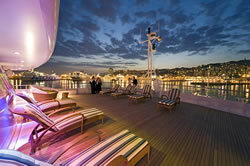 Throughout the day, relax on the sundeck. After a session in the gym or sauna, have a massage before sunbathing and cooling off in the Jacuzzi. Have lunch, buffet style, before trying out the jet skis or other equipment. The beauty salon can help get you ready for the evening. SALOON The main saloon has several sets of sofas and arm-chairs. After dinner is the perfect time for a nightcap by the grand piano or a glass of champagne outdoors on a balmy evening. DINING SALOON After cocktails, move downstairs to the mahogany paneled dining saloon. The large mirrored ceiling, intimate lighting and formal setting create an elegantly formal atmosphere. CUISINE The head chef and his skilled team are masters of cuisines - French, Italian, Chinese, Indian, Greek, Russian, fusion or ethnic. We can cook to order or even create a menu. A banquet for fifty guests, dinner in the private dining room or just table for two are all served with slick, discreet professionalism. The finest crystal, china and cutlery grace all of the tables that can be laid up for breakfast, lunch and dinner. Food can be served at the location of your choice. 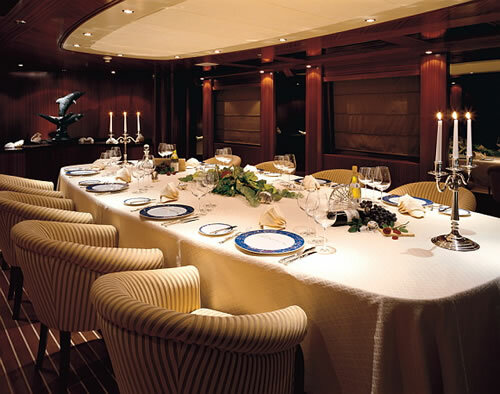 From a simple sandwich to a grand feast, meals aboard Lauren L are always of the highest quality. CONFERENCE FACILITIES When it's time for work, seventeen guests can sit around the conference room table. 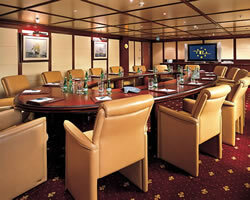 A fully integrated multi-media system with 50" plasma screen is set up for Internet access, video-conferencing, and presentations. The library is set up for less formal presentations or as a cinema with over 600 films and 10,000 music CDs as well as satellite television. 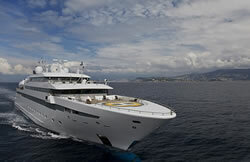 Internet and email workstations are linked up to the yacht's broadband system. 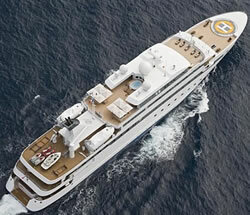 Film and books can be brought in especially for your charter. HELIPAD The built in Helipad has a unique extendable hydraulic platform to accommodate helicopters of up to 4 tons for landing and take-off. 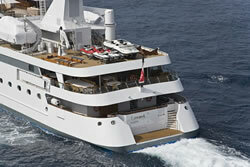 MASTER SUITE: The 100 square meters Master Suite is situated on the Bridge deck and includes its own private balcony. The luxurious accommodation features a superior Californian king size bed and en-suite white marble bathroom with a double Jacuzzi bath, shower room and separate basins, WC and bidet, with walk in wardrobes. 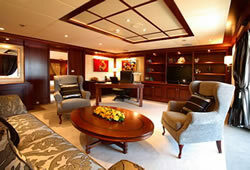 The suite also has a subsidiary private saloon with a fully equipped study. VIP SUITES All suites have en suite bathrooms, large wardrobes and Italian linen and towels. Lauren L is the height of comfort, day or night. Length:90 m / 296 ft.
Beam: 14.44 m / 48 ft. Draft:3.95 m / 13 ft.